1. what about the oscilator coil, how many turns? 3. what do you mean with 4k7 near the L2, is that an resistor? OSC is a variable inductance with parallel capacitor. You can get them in shop in shape of a metal block and it will have an adjusting screw thread (ferrite cup) tunable through top hole. Ask shopkeeper for FM Oscillator coil. 10.7Mhz ceramic resonator has 3 pins. The middle pin is connected to both the upper line and the lower line. kindley send me circut for 3v operated fm receever circuit, and details . the element after the +3v input, it’s a resistor? what value is 47E? It’s 47 microFarad 16 Volts electrolytic polarized capacitor. Is the IC used is costly in INDIA? No. It costed around 20Rs (back in 2006). You must use the oscillator and exact value capacitors. Can this IC be replaced with CD2003GP? I guess that’s a replica of the original IC. You can use it. 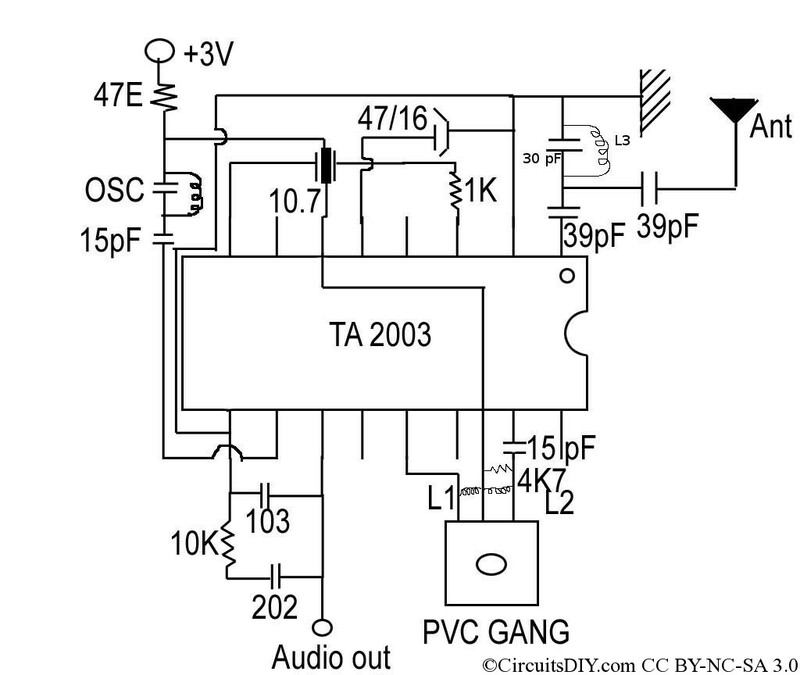 Can the output from this reciever be directly fed to audio amp using LA4440 or we have to use any pre-amp’s. Yes, it can be directly fed to an audio amplifier. I found 3 pins each on up and down side of OSC the side leads are extension of metal cap how to connect this in the circuit. Take a close look from the bottom, you’ll see wires are connected to only two pins. Use those two pins here. I have 18pf capacitor can i use it in place of 15pf cap? You can try with 18pf caps but I can’t guarantee it will work. You can buy a 0-22pf adjustable capacitor from market and tune it at 15pf. Hi Arup, have not set this up but am just wondering why pin 14 is not connected to VCC fro FM? 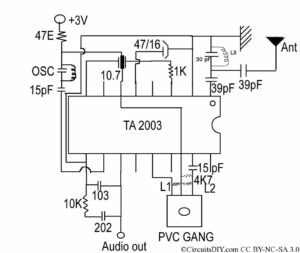 The datasheet for the TA2003 says that it must be connected to VCC for FM and left open for AM. Also, why is the coil in Pin 10 called an OSC when it is at 10.7 Mhz? Just wondering cuz datasheet shows what look like a symbol for crystal at 10.7Mhz. What does that coil do? I helped many Indian friends build RC transmitter and receiver where I have lots of experience. Excuse me arup. I just try help give the answer. PIN 14 should BE connected to vcc for fm. Local oscillator coil at PIN 13 not 10. Hello Mr. Gani Saputra Albatami, as of now Arup doesn’t maintain this site very actively. And I’ve no idea about TA2003 IC, it’s pretty obsolete now. Anyway I’ll update the schematic from the datasheet. Again, Pin 10, am not sure if the datasheet meant ,crystal or simply ceramic filter or capacitor. BK is correct refer to datasheet. Pin 10 is fm descriminator or audio detector part. Use IT if fm blue color or ceramic resonator. Can’t use ceramic filter or xtal filter. May arups circuits wrong as he just human and make mistakes like us. The centre pin in ground and other two pin’s orientation doesn’t matters. A good tip though, thanks ! I’ll add a picture of the ceramic resonator’s pin out.